Insulated wire embedded in a yard tree, hit by the sawmill blade. As we’d expect with the arrival of spring and home-improvement season ramping up, we’ve received many inquiries in the past few weeks from landowners with standing trees they wish to sell. OCH is interested in purchasing trees, depending on what our log inventory looks like and what projects we have coming up. But those conversations almost always involve some resetting of expectations as to how much those trees or cut logs are actually worth. Here are some factors we need to take into consideration when making log purchasing decisions and pricing offers. Most people know how to identify many kinds of trees by their leaves, but in a leafless state it’s easy to mistake one species for another. Dan and other log buyers are able to identify a tree by its bark, and not just to tell a cherry from a poplar. There are many different varieties of oak in our area, for example. White oak has high rot-resistance and therefore is highly desirable for outdoor applications, such as timber frame porches. Red oak is more often used in interior applications such as flooring, furniture and cabinetry due to being fast-growing, easy to dry and plentiful. Swamp oak and pin oak are basically low grade versions of white oak and red oak, respectively, and are most often used in construction for mud mats, trailer decks, or truck side boards, and are worth less consequently. Pricing logs correctly therefore means identifying them correctly and determining if the needs of our upcoming projects match the appropriate uses of those species. We can tell who paid attention in geometry class when we arrive to assess the logs for sale and discover that what we were told are walnut logs 24-inches in diameter are actually 24-inches radius. The diameter of the tree matters a lot, especially for species that often have thick rings of lighter colored sapwood immediately underneath the bark before the darker, more desirable wood begins, like walnut. To measure diameter, hold a wooden yardstick against the trunk at eye-level, and squint to line up left edge of the bark with the end of the stick (although due to the curve of the tree it won’t be touching the stick). Read the measurement by squinting at the right edge of the bark. Knots make wood less valuable, and knots occur at points where branches grow. The taller the trunk before the lowest branches begin, the more valuable the log. White pine and red pine still have value with lower-growing branches, due to their knotty nature in general, but other species are seen as more desirable with clear grain, and are therefore more valuable. If the trees you are seeking to sell are still standing, we need to take into consideration what our costs would be to take them down, and those costs are largely determined by the surroundings. How close they are to yours or a neighbor’s house or other structure, whether there are wires to avoid, sloping ground to contend with, and whether the felled logs would be easily accessible to a driveway or road for loading onto a truck. Trees in tricky contexts often require a climber to carefully dismantle them, limb-by-limb, without damaging anything in their surroundings. Some even occasionally require the use of a crane. If we would have to hire in a special skill set or equipment, those costs would have to be deducted from the price we can pay for the logs. Trees that have for many years stood in someone’s yard almost certainly contain metal. Nails are the most common culprit, but electric insulators, wires, even bullets frequently turn up embedded within the wood of yard trees. When a log goes onto our sawmill, each time metal is hit the bandsaw blade is ruined and must be replaced at a cost of $30 per blade. Some trees can be so full of metal as to require multiple blade changes in the sawing of the log. Therefore, we can’t pay as much for a yard tree as for a tree that resided in the forest and is less likely to contain embedded metal. Transporting logs is costly in terms of fuel, equipment and time. How far away the trees are from our sawmill in Barberton, Ohio factor into the price we can pay for the logs at the pick-up point. Also, transportation time and expense can be difficult to justify in the case of just one or two logs, unless they happen to be highly desirable to us for other reasons. All this isn’t to deter you, however, and exceptions to any of the above considerations can be made if you have the right kind of logs that we happen to need at the right time. When in doubt, give us a call at 833-718-2531 or Contact Us and we’ll be happy to consider your situation. 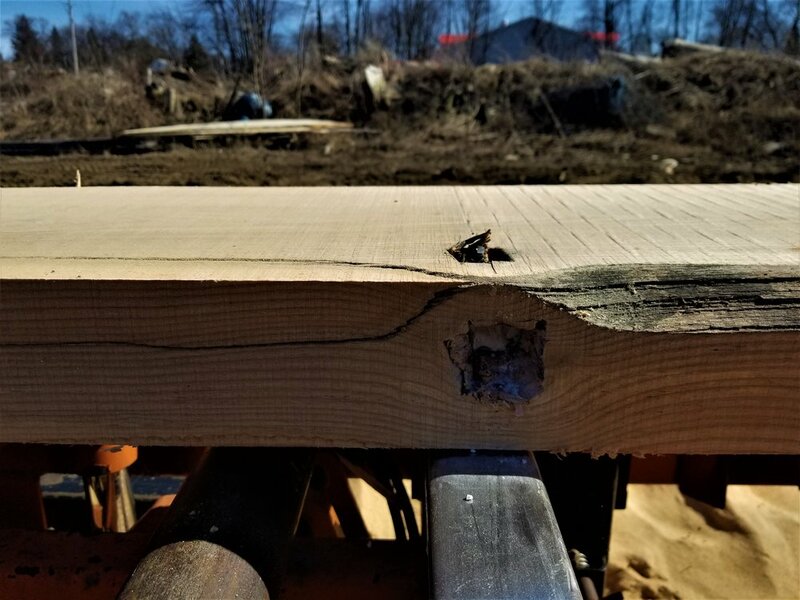 After all, something that OCH has going for it that many larger lumber operations don’t is that we are small in size and don’t need to procure the volume of logs that others do; we can consider purchases on a case-by-case basis.